What the hell, I’ve now read this book twice with every plan of reviewing it, and then it just….fades out of my memory. Why? I enjoyed it! What’s wrong with me? I Thought My Soul Would Rise And Fly: The Diary of Patsy, A Freed Girl, Mars Bluff, South Carolina, 1865, Joyce Hansen, 1997. Seriously, I don’t know why I keep thinking I’ve already finished reviewing this book! I have not. And it’s quite good! And on a side note, the audiobook of this is also very good—the reader is excellent. If you can get past the weirdness of having the date and location read to you every thirty seconds, it’s great. I digress ALREADY. Anyway, this book is very well-written and very touching, and one of the things I enjoy the most about it is that Patsy is disabled, but it’s not the focal point of the book like it is in Mirror, Mirror on the Wall. I mean, in fairness, that one was about a girl at a school for the blind, so it was baked right in, but still. Patsy here has a debilitating stutter and a limp, but it’s never the focus—it definitely informs her capabilities and affects her life, but it doesn’t hamper it unduly. It’s well done. Also notable about this book: since it’s about a freed slave, I thought the title was going to refer to her disappointment when freedom didn’t fix everything about her life. It doesn’t—it’s a line from a spiritual and it’s about joy. So there you go. I have been putting off this book for a long time and I don’t know why! It was one of my favourites as a kid, despite its extremely depressing plot, almost entirely due to the fact that it has a Scrappy Underdogs Win plot (well, sort of) plus Love Against The Odds, which I am a sucker for and clearly have been ever since the age of ten. A Picture of Freedom: The Diary of Clotee, A Slave Girl, Belmont Plantation, Virginia, 1859, Patricia McKissack, 1997. Patricia McKissack is a great author, and I love her writing, and I love that Dear America had her do three books (plus a Royal Diaries book! ), but I just wish they had branched out to include some of the other fantastic YA writers of colour. Bigger, better question: why aren’t there more YA and children’s authors of colour out there? That is too big of a question to get into here, but I’ll settle for saying that Patricia McKissack is great and everything she writes is worth reading, and this is no exception. I always felt kind of bad about the cover styling of this book, though. The cover portrait is from a Homer portrait, The Cotton Pickers, which is of two young black women picking cotton (duh), and it’s a lovely picture, but I feel like the detail in particular is a little….lacking? I mean, now that I’ve sat here examining it for a while I can see that the girl in question is wearing a high-necked dress, but at first glance the abstraction of the portrait leaves the cover looking a little bit on the drab side. Maybe I’m crazy. Am I crazy? Look and tell me. Also, if I’m not mistaken, I wonder if the name “Clotee” is derived from “Clothilde?” In a sort of roundabout, Southern-accented, slave-name kind of way? Feel free to tell me I’m insane, I’m just spitballing wondering now. If I’m going to complain about him, I may as well go for my Barry Denenberg completion badge. Book: When Will This Cruel War Be Over? 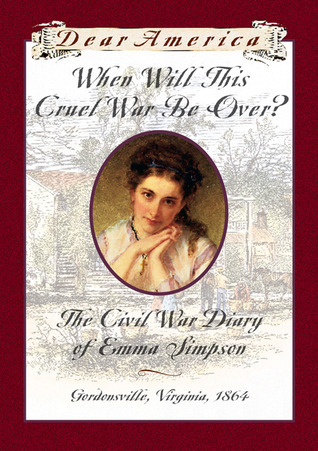 The Civil War Diary of Emma Simpson, Gordonsville, Virginia, 1864. Barry Denenberg, 1996. I have never figured out why this is considered one of the classics of the Dear America books, other than it was a fairly early one, dealt with the losing side of the Civil War, and probably consequently wound up being used in several school curriculums. Emma is such a drip that it’s difficult to get through, which is saying something for a book that’s only 152 pages long. I have no memory of this book, but it’s a Civil War book so I imagine it’s going to be a great big bundle of presentism and irritating bits about race all wrapped up with a poorly-thought-out romance arc. 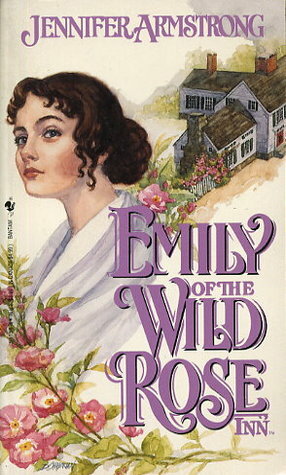 Book: Emily of the Wild Rose Inn. At the beginning, we learn that Emily Mackenzie is the current sixteen-year-old resident of the Wild Rose Inn, as is the sixteen-year-old Lucy Sykes, a black girl who is Emily’s best friend slash foster sister. Apparently a scarlet fever killed both Emily’s mother and Lucy’s parents when they were three, although exactly how Lucy came to live with them is not made clear. They’re out sailing, as is Micah Handy, the current Handy son, who seems to be just as arrogant as the rest of the Handy clan. Although the Handy’s inn seems to have experienced a rapid turnaround, since they’re doing quite well now, and Micah is out in his own sailboat showing off to some other girls. Emily is apparently not the sailor she thinks she is, since the boom clocks her and knocks her right into the water. Lucy rescues her and their talk turns to abolition, as people frequently do when they have nearly drowned, and they see a flag back at their inn signaling that they’re needed at home. I’m sensing a theme here that 16-year-old girls are not keen on doing their damn work.